Hostilities began more than a year before the Declaration of Independence was signed in July 1776. After initial success at Concord, the Americans attempted to conquer Canada but were repulsed on the last day of 1775 and gave up the following spring. In Massachusetts, where the war had begun, the main British army evacuated Boston on 17 March 1776 and for several months no British soldier stood on the soil of the rebellious thirteen colonies. A declaration of independence by the Americans was now feasible. It was also necessary if the Americans were to gain the foreign help they hoped for. 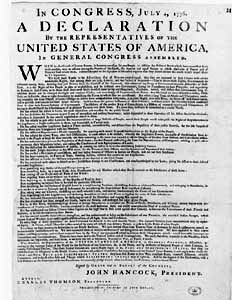 Congress appointed a drafting committee on 11 June 1776 and Thomas Jefferson's historic document was approved on 4 July, which has been celebrated as American Independence Day ever since. The document shown here is one of only twenty one original copies of the Declaration of Independence known to survive.